I was recently gifted with a copy of a beautiful little book that is most appropriate for this season of Thanksgiving. Bless This Food, a collection of ancient and contemporary graces from around the world, contains some of the most beautiful and interesting sentiments for the most commonly said prayer in homes worldwide. “Saying Grace” or “Asking the Blessing” was something that my sisters and I were taught from the time we were toddlers. Maybe even before. I just know that it is a part of my earliest memories and something that we still practice daily. Even if you’re not the most devout believer, saying Grace is a beautiful way of giving thanks for the blessings of life. I believe it provides a moment to reflect and sets a tone for the meal. We taught our daughter the “God is Great” blessing from the time she was old enough to understand and my husband and I often say the Grace that my Daddy always used – “Humble our hearts, dear Lord, and make us thankful for these and all our many other blessings. Amen.” Not only is it a simple, beautiful expression of thanks, it’s a way to honor and remember him. According to the book’s author, Adrian Butash, “the simple act of saying a blessing before a meal can bring us closer to our brothers, sisters, parents, and friends.” As he writes, “The occasional gathering for prayer, no matter how brief, keeps the heart and mind in touch with the most fundamental of joys: belonging.” I couldn’t agree more. I was completely captivated by the variety of graces, particularly the more ancient ones, contained in Bless This Food. This collection of 160 prayers includes such diverse blessings as a Gayatri hymn (circa 1500 B.C. ), an Egyptian prayer (3100 B.C. ), a selection from the Dead Sea Scrolls, many early Christian graces, and ancient Native American prayers. He left it for us. Something that should be for the people’s happiness. They will be strong in body from it. He left us all this food. He scattered this all over the Earth. Now we will give one thanks. That he has left us all this food to live on. The prayers contained in the book have been carefully selected from each of the world’s major religions, as well as from ancient traditions and the work of great poets, thinkers, and activists such as Milton, Gandhi, and Mother Teresa. The author even includes two prayers in American sign language. If you’re interested in exploring a copy of Bless This Food, it’s available through Amazon at this link or from the publisher here. By the way, I’m in no way affiliated with the author or publisher of Bless This Food. I just think it’s a beautiful little book and I wanted to share it with my readers. 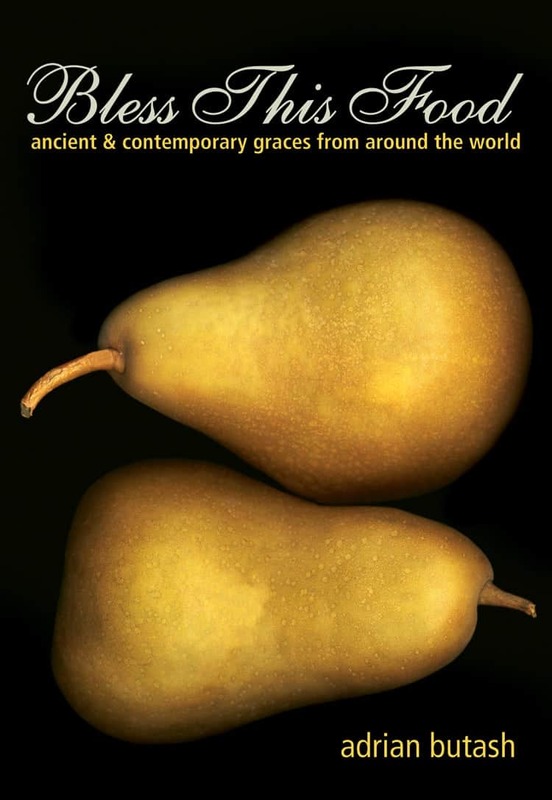 The prayers in this post were excerpted from the book Bless this Food: Ancient & Contemporary Graces from Around the World © 2013 Adrian Butash. Printed with permission of New World Library, Novato, CA.www.newworldlibrary.com. So now I’m curious. Do you say Grace at your house? If you do, what is your favorite short blessing? Yes, we say grace-usually speaking to God instead of reciting a blessing. Food tastes even better. Thanks for your post. Yes a blessing is said at my table. One of the happiest memories of mine is when my children were small and all gathered around the table to give thanks. Grace … spoken, given, received, stirs the soul unlike anything in the natural. This book sounds facinating, will have to pick it up. Thanks for sharing, well timed. :) Thankfulness mends the heart and protects it from envy. The following is supposed to be the prayer of a soldier in the Civil War. I don’t know if he wore blue or gray. I do know that he loved God. This prayer was repeated often by Max Cleland. Whether you agreed with his politics or not, his tenacity and courage were an inspiration. I have often remembered this prayer, and found myself humbled by how much of what we believe to be daily challenges are so trivial. With blessings to all, and Thanksgiving to God. That’s a beautiful prayer. I love it. Wonderful prayer and may everyone say such a thing. God Bless all and We do say blessings at our table no matter how many are present. We do say grace, but not one same prayer. Usually ask the kids what they are thankful for that day. Amy, I don’t it matters at all how you actually say grace, just that you give thanks!